No baby yet, which is actually okay as I'm only 37 weeks. But my doctor is probably going to have me induced at the end of next week *fingers crossed*. In the meantime, I'm going to let my nesting instinct take over (why did the front room closet never bother me before this week?) and pull back on blogging. 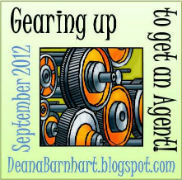 While I'm taking a break from writing actual posts, I'm going to be busy making friends for the Gearing up to get an Agent blogfest (GUTGAA). If you haven't heard about it, it's going to be an awesome pitch extravaganza with lots of agents and even a few small publishers involved. So if you're in query mode you'll want to check it out for sure. Even if you're not pitching you should check out the blogs on the linky and make a few new friends. That's what I'm planning on doing until baby is born. I'm hope to meet lots of you before September 1st! Are you joining GUTGAA? Anything else fun happening in September? Oh you're so close! Fingers crossed for next week!!! GUTGAA sounds like an awesome idea :D I'm not in the querying phase yet so I'll probably do what you're doing. Take a break and conserve your strength. Hope all goes well next week. And have fun with the blogfest. I'm taking a full-September blog break! Rest up for the inducing. Good times ahead. I wish I could be ready for that blogfest. I'm not though. We'll miss you, but I'm sure you'll need a break from blogging once the baby comes. Good luck!!! Good luck! Off to check out GUTGAA. So exciting! Definitely get some rest and take it easy this week. Good luck to you!!!! I hadn't heard of this until now, but I think I may very well sign up. Thanks! Glad to hear you're in for GUTGAA! I hope you're feeling well. Hang in there! i'm totally in! i need help! HELP! I don't have the time to participate in GUTGAA this year, but hopefully next year. What an exciting time for you. Babies are such fun. I hope I'll get to chat with you in Sept. as we Gear up to Get an Agent. I'm not taking part in the agent thing - I'm not sure I'm suitable material for attracting an agent. I hope all goes well for you and your soon-to-be baby!!! Woohoo! That is great news. I'm just coming back from a long summer break. I'm going to have to check out the GUTGAA! Thanks for letting us know about it! Not pitching yet I'm afraid. Know I should be by now. Enjoy your new baby's arrival. Thanks for commenting over on my blog. I'm looking forward to the GUTGAA (funny acronym) since I finally have a finished novel! Woohoo! I did it last year, and it was a great experience. Good luck with it . . . and the new addition! I don't know how much of it I will actually be able to participate in, but I'll be there! :] A baby, that's wonderful! I wish you good luck!